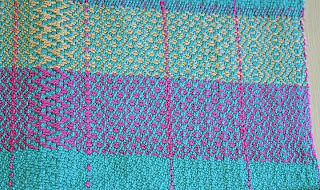 I finished weaving the pattern gamp last night; today I hand-hemmed the ends (I must really like this thing - I hate sewing), washed, dried and ironed it (see note above - hate ironing too) before setting up a photo session. AJ was sound asleep until she heard the click of the camera - she had to be in the center of every picture after that. I'm really pleased with how this project turned out. 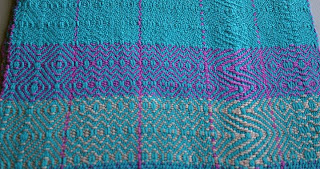 So many pretty patterns to replicate in towels or shawls. When I cut the pattern gamp off the loom, I was careful to leave the threads in the reed so I can tie on a new warp and weave another project. 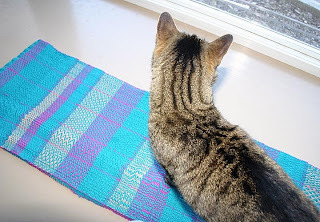 I think a set of four towels, using the same teal and violet 3/2 cotton for warp and a cream 8/2 cotton for weft. Should be interesting. 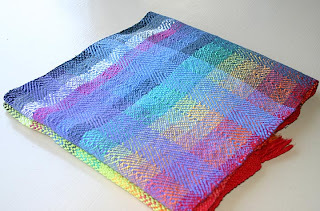 Since I was photoing - and ironing - I took pix of the color gamp I started last July and finished this past Thursday, only because I needed the loom for the weekend workshop. 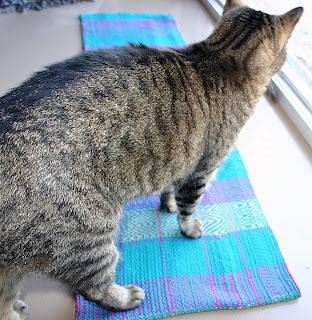 I had a lot of broken warp threads and other frustrations with this project. Great as a learning experience; not so great for my irritation level. I wasn't that crazy about how this looks when I first washed it, but it's growing on me. I think I'd like to do another one using a firmer fiber - maybe pima cotton - so the colors don't fuzz into each other so much. 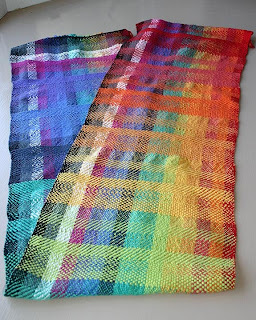 How about that - I've got two weaving projects for Guild show-and-tell this week!